Happy Friday, crafty friends! 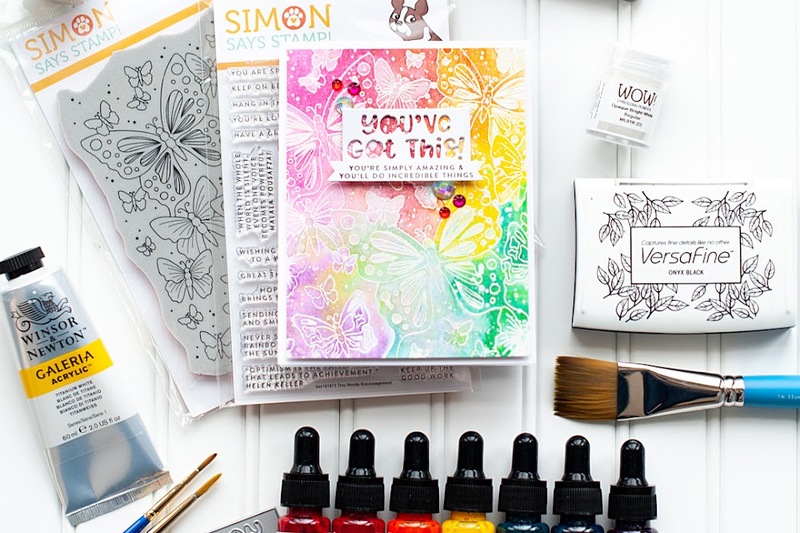 It's always a happy day when we are celebrating a brand new release from Simon Says stamp, right?! 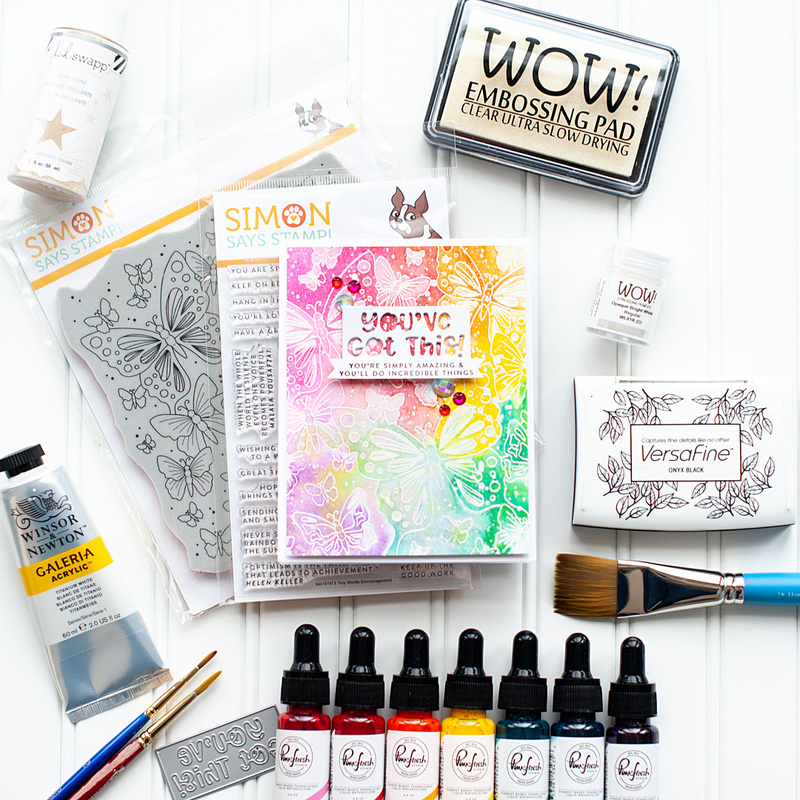 Their latest collection is called Blossoms & Butterflies, and it is full of lovely products! Simon is doing a free Unicorn Dust Glitter as a gift with purchase promotion - just use the code BLSM999 upon checkout to take advantage while supplies last! The code will expire on Sunday, 04/14 at 11:59 pm ET. 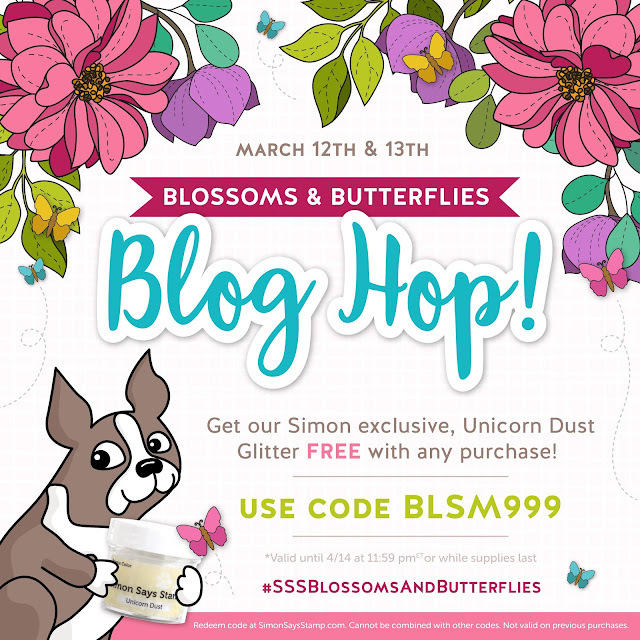 This is day 1 of the Blossoms & Butterflies Blog Hop, and we've got quite the lineup for you! I will put all of the blog hop details at the end of my post, but how about we get to my cards first? 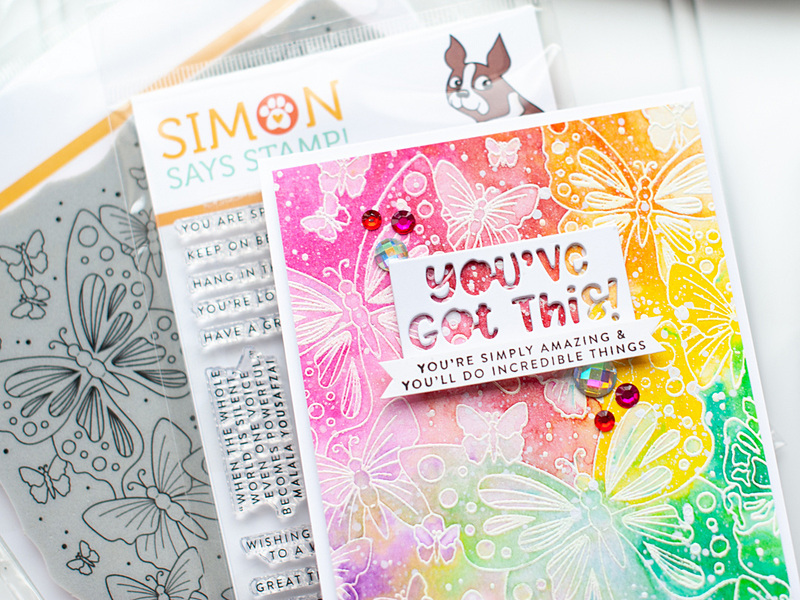 I've got a fun rainbow colored card for you today, using the new Outline Butterflies background stamp, along with Tiny Words Encouragement. I've paired them with the You've Got This die from the Diecember release, which I didn't get a chance to use then. It pairs perfectly with this new Tiny Words stamp set! I started by heat embossing the Outline Butterflies in WOW white embossing powder to a panel of heavyweight white cardstock. I taped the heat embossed panel to my Waffleflower Water Media Mat, then added a generous water wash to it. 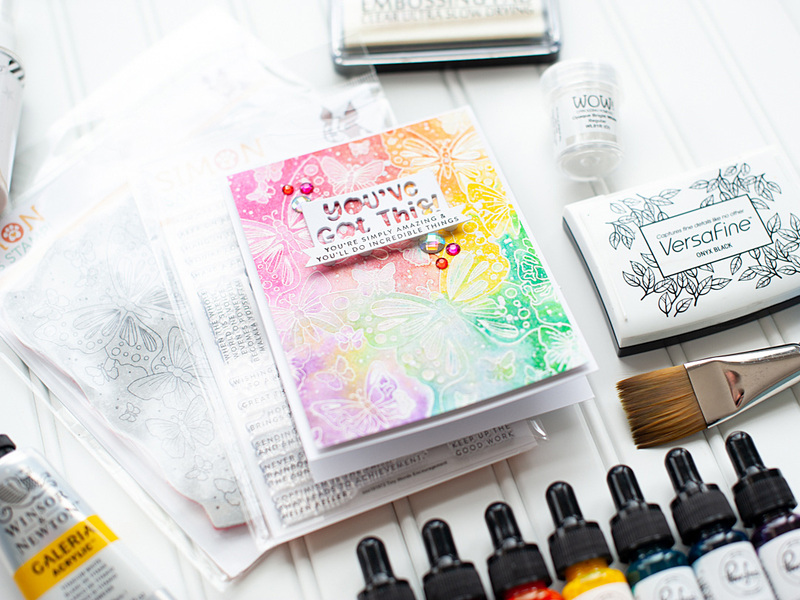 Then I used my drop & spray technique with Pinkfresh Studio liquid watercolor to create my rainbow background. It's a super fun & easy technique that works perfectly with background stamps like this one! I heat set the panel, then spritzed it down with shimmer spray. Next I diecut the word die from heavyweight white cardstock three times, and adhered them together with a Zig glue pen. Then I stamped the Tiny Words Encouragement sentiment to white cardstock in onyx black Versafine, trimmed into a thin strip and added banner edges to it. At this point I layered all the elements to the front of a white A2 card base, using foam adhesive on the rainbow panel. I splattered the front with titanium white paint, then finished by accenting with my signature trios of jewels. That is what I have for you today! How about we get to all the fun blog hop info now?! Be sure to hop along and leave comments along the way for your best chance to win one of the prizes! Finally, if you'd like to see even MORE inspiration from this release, check out the Blossoms & Butterflies Collection Gallery. And be sure to link up YOUR creations too! It looks like I am the end of the hop, but before you move along, I wanted to invite you to follow me on social media. I would love to be crafty friends! Alright friends! Happy hopping, and happy Friday! Amazing card. Love the super vibrant background. And the die-cut sentiment is absolutely gorgeous! Beautiful use of those colors and the outline stamp is gorgeous. Love it. Your cards is so vibrant, happy and special, Lea! 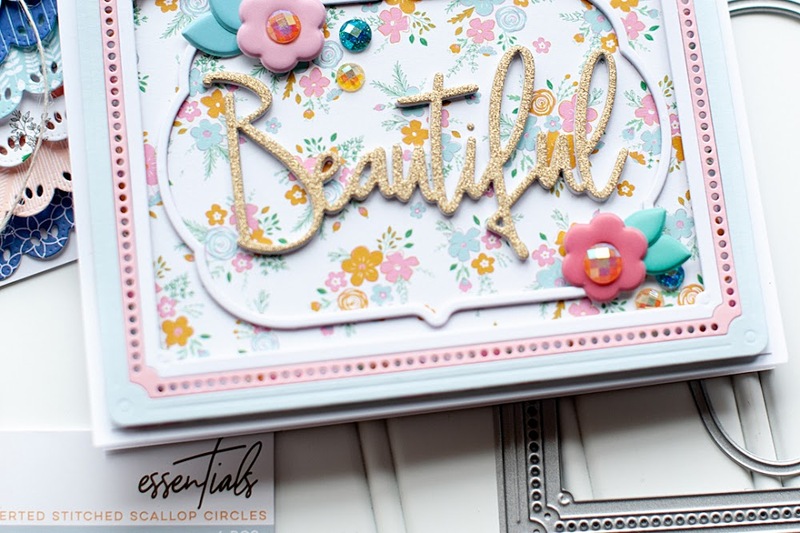 Gorgeous choice of colours to showcase that gorgeous embossing! Thanks so much for sharing your wonderful inspiration! Such gorgeous colors! Love this card! What a gorgeous card! I love the bright/happy colors with those white butterflies over top! I love your background. Your colors are so happy and cheerful. Well done! I'm a huge watercolor fan! This is just beautiful! Gorgeous card! Loving the bright colors and the white embossing! Oh, who wouldn't love to have the outline butterflies stamp? The use of the Pinkfresh watercolors in a rainbow of shades is just perfect. That is so pretty! Your instructions on the blog made it simple to understand! What a beautiful and colorful card. The watercolors are so vibrant and pretty. Wonderful - I love that flowing water colour look - it gives a very dreamy, romantic feel to the card - thanks for the inspiration! 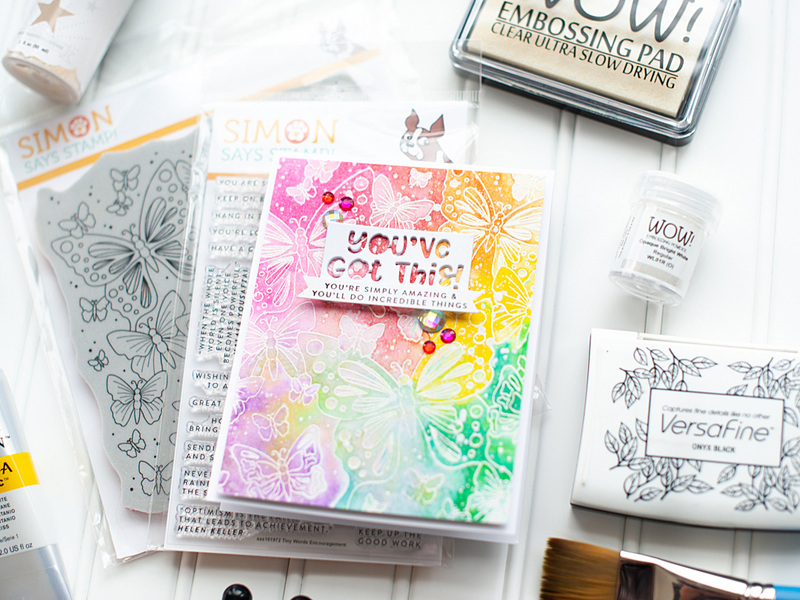 Gorgeous card you have made today, I'm loving that large butterfly background stamp-it's amazing! I love the look of watercolors - Just wish mine would look like yours. So pretty! Wow! Your watercolor techniques/results are out of this world! Your card combos are phenomenal!! Really gives me courage to try some new things & purchase some of these new products ! Thanks for participating in the blog hop ! I love that butterfly background stamp and this is such a beautiful card. 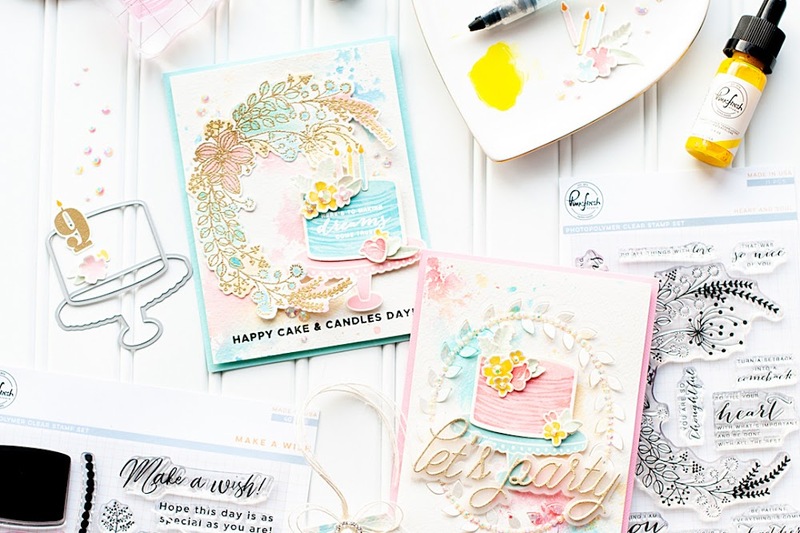 What a great ending to this fun and inspiring blog hop! Love love this card. Great SSS release! WOW WOW WOW love this card, your background colours against this stamp are stunning!! Just love this card of yours with play of colors!! I so love what you've done with this card. The colors, the bling, the pure beauty is just awesomeness. What a fabulous card, Lea, I am in love! I love the soft pastel colors of this card. Wow!!! So pretty!!! I am going to have to give that technique a try - I just got some watercolors, yay!!! Such a lovely card! I really like the background and the negative die cut sentiment! I LOVE your card!! Yours is the last stop for me on this hop and, I must say, I saved the best 'til last. Your card is gorgeous!! Love the way you combined the sentiments too! That sentiment die is...well to die for! Love this card, the colors, the shimmer, the sentiment. This is such awesome card, I love the way you used all those gorgeous colours to your panel. I have to admit, i am fond of bright colours and butterflies, you ticked all my boxes with this awesome card! Thank you so much for sharing Lea and have a great weekend. 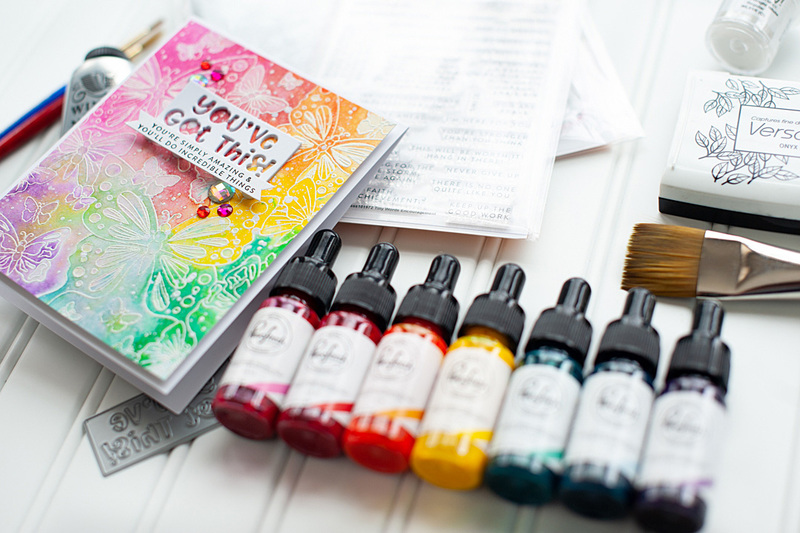 Your water coloring is beautiful, the stamp, color choices, and paint make a clear difference. 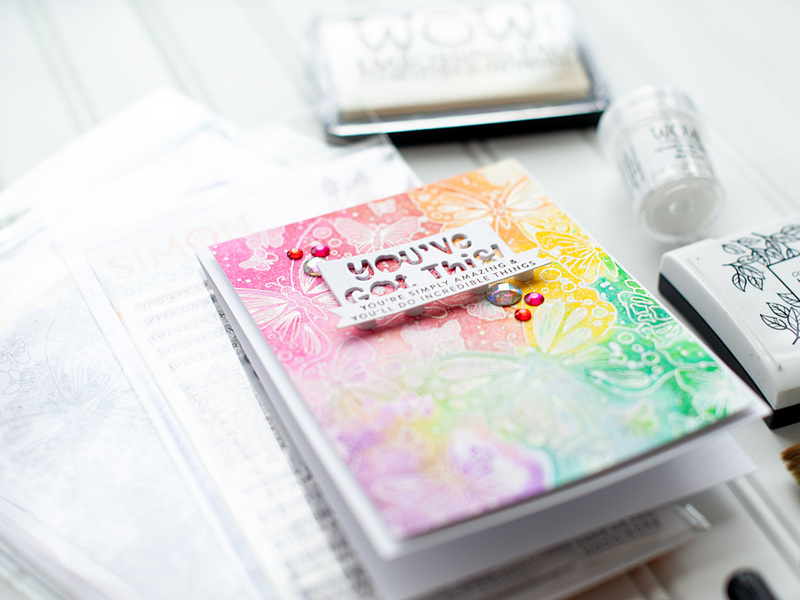 I love encouraging cards, and this one is just gorgeous. Your card is beautiful! It's a great background stamp! Absolutely beautiful! So lively with the vibrant colors and those butterflies are just fabulous. Tricia Podmore here, just oh my my you nailed that card! Gorgeous beautiful and sooo stunning. Such super inspiration using this new release. So thrilled to find you through this hop. Lea!! You're my card making hero!!!! Stunning! The white embossing looks AMAZING!!!!!!!!!!!!!!! The colors look awesome with it. great cards, love colors, the butterflies are perfect. Thanks for sharing your inspiration. So many fantastic products in this release, Can someone have too many butterflies? I think not! Love your card.. this release is awesome. What a wonderful release. Love your card. Incredible background! I love the colors! I love the butterflies! GORGEOUS! Such a Bright and Beautiful card!!! Your card is absolutely gorgeous, Lea! That watercolor background is so, so pretty. I'm so curious about your drop and spray technique...I love the look! Lovely card with the butterfly background stamp. This butterfly background stamp is one of my favorites from this release and you have done an amazing job with it, Lea!! Very pretty, love this stamp! Beautiful background. A technique I have not used. What a beautiful background you created! Love it! And so would my granddaugthers! So sweet and feminine. Such a beautiful new butterfly stamp. Your card is beautiful! omg what a gorgeous card! that embossing!! wow superb! That Background.. WOW.. Perfection. TY! Oh Lea, you are so so talented! Just love this! 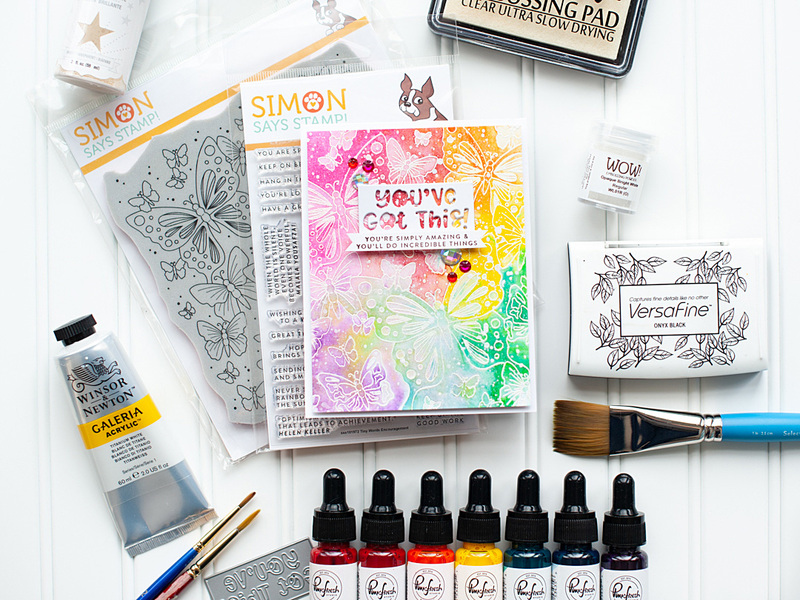 I love the butterfly background stamp & you've used it to perfection here! I wasn't going to get the Butterfly BG but after looking at this card I just might. Love this look! Gorgeous card! I just love the PFS liquid watercolors! Love the acetate butterfly card. How divine. Love this release from Simon. Beautiful!! Love your design! Thanks for the inspiration. Wonderful card. Love all the color. Wow, just love this card, such a cool technique that makes the design pop out. Wow!!! I love your cards and this is such an inspiration. I want that background stamp!! Wow! As always, your card is totally gorgeous! Colors are amazing!!! I love your colourful background. A beautiful card! Love the soft spring colors in the background. WOW! That background is so stunning! Gorgeous card! Love the wonderful background. Incredibly gorgeous background on your card!!! Beautiful stamp, gorgeous colors, stunning card! Love the technique! Love your card!! So soft and beautiful!! Wow!!! Those are fabulous. I would love to see it done in a video though. Thanks for the instructions. Love the Pink Fresh Line you used. Beautiful color choices. Thank you for sharing and the inspiration. Beautiful card, Lea. Love those vibrant colors for the background . Such a lovely cad!! Beautiful background! Gorgeous card. I love the Outline Butterflies background stamp and your coloring is beautiful. What a gorgeous background, Lea! Love the stamp itself & your awesome coloring really brings it to life! What a beautiful card. I am loving this new background stamp. Of course...there are a few of them that I have my eye on. LOL. Thank you so much for sharing your lovely work today. Hope you are having a great weekend. Hugs! So love your beautiful card! This is my favorite yet, cool technique using the Outline Butterflies background stamp. Love everything about this card! What a fun and fabulous card! You water colored it perfectly. Love the rainbow colors with the beautiful butterflies! What a beautiful conclusion of the Day 1 hop! WOW! Beautiful Beautiful card. I love the emboss resist. Love the use of the watercolors and the background of your card. Lovely job. Great use of the SSS products. Thanks for sharing your creativity! This looks really nice. I like the idea of the watercolors rainbow. This stamp makes for a lovely card. Gorgeous colors and butterfly design! Beautiful card! 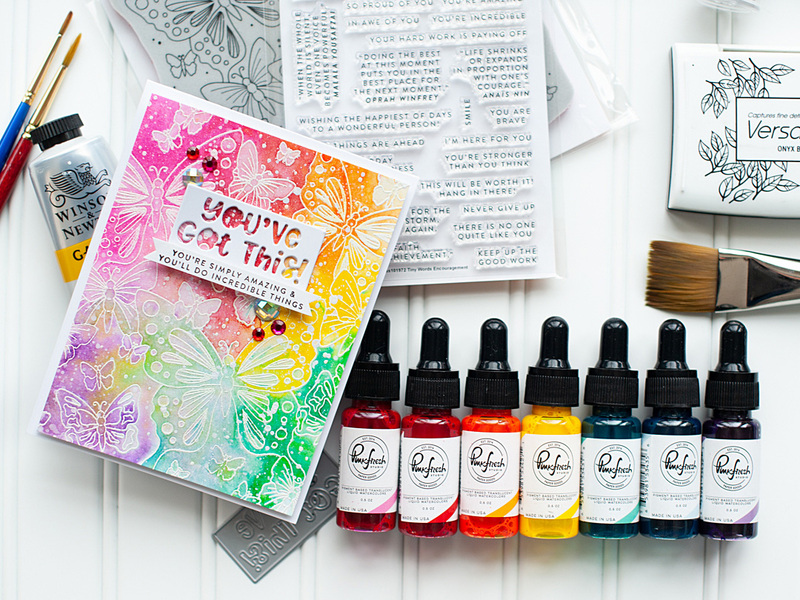 The Butterfly background is my favorite product from this release and I love how you used the liquid watercolors to create this rainbow background. Just gorgeous!! I''m a sucker for butterflies. This is a beautiful card. SQUEAL!! I LOVE LOVE LOVE this!! Such BEAUTIFUL Card Design!! THANKS SO MUCH for sharing and have a FABULOUS WEEKEND!! I love your card!!!! I love Pink Fresh watercolors!! They are gorgeous!! Your card screams FUN! Beautiful job. Beautiful card, love all the color! The colors really pop! Beautiful card. Boy, I wanna do a drop and spray technique! Way cool! I'm surprised how bright those liquid watercolors stayed! Amazing! TFS! Beautiful card! I love the watrrcolored background! Thanks for sharing your card! Rainbow is my favorite color! Love your card!!! Love the rainbow of color. Stunning project. Stunning! Those butterflies are so whimsical! And I love love your colour choice. You amaze as always. Butterflies and rainbows go together like bacon and eggs! You used the PF watercolors so nicely, and this whole card is just a ray of sunshine. Thanks for sharing! Pretty colors and I like the embossing. I haven't tried my liquid watercolors but now I really want too! Great card!